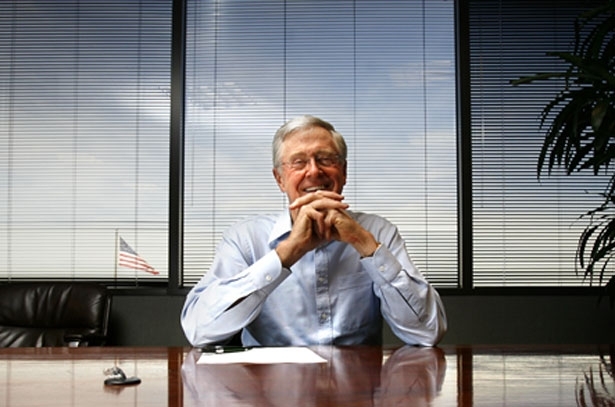 Documents reveal Charles Koch founded the group that’s protecting oil industry handouts. “Lifestyles of the Rich Environmentalists,” produced by a group called the Institute for Energy Research, is a slick web video campaign designed to lampoon Leonardo DiCaprio and will.i.am as hypocrites for supporting action on climate change. The claim is that wealthy celebrities who oppose industrial-scale pollution supposedly shouldn’t fly in airplanes that use fossil fuels. The group, along with its subsidiary, the American Energy Alliance, churns out a steady stream of related content, from Facebook memes criticizing the Environmental Protection Agency, to commercials demanding approval of new oil projects like the Keystone XL, to a series of television campaign advertisements this year attacking Democratic candidates in West Virginia, Colorado, North Carolina and Alaska. On Capitol Hill, IER aggressively opposes any effort to repeal tax breaks afforded to the oil and gas industry. Documents obtained by Republic Report reveal for the first time that the group was actually founded by none other than Charles Koch, the petrochemical, manufacturing and oil refining tycoon worth an estimated $52 billion. IER has no information about its founding members on its website, and only lists a board composed of seemingly independent conservative scholars and businessmen. Earlier reports revealed that IER/AEA has received grants from Koch-funded foundations, and that its leadership includes several individuals who have at times worked for Koch or Koch-related interests. But this is the first time it has been revealed that Charles personally founded the organization. In October of 1984, Charles, then using a Menlo Park, California, address, founded a nonprofit called the Institute for Humane Studies of Texas. That organization briefly lost its charter in 1989 for failure to pay the Texas state franchise tax. Four years later, incorporation documents reveal, the group rebranded as the Institute for Energy Research, or IER, which later formed a subsidiary called the American Energy Alliance. IER/AEA’s advocacy contrasts sharply with Charles’s personal brand as a selfless libertarian activist. The industrialist has argued that he is resolutely against special government handouts, such as tax credits or subsidies that benefit one industry over another. “Far from trying to rig the system, I have spent decades opposing cronyism and all political favors, including mandates, subsidies and protective tariffs—even when we benefit from them,” Charles wrote in a column for The Wall Street Journal this year. But Charles’s group, IER/AEA, has fought to protect special tax breaks that benefit fossil fuel producers. Along with issuing press releases against various federal efforts to eliminate oil and gas industry tax credits, IER/AEA commissioned a study claiming that such tax reforms would have an adverse effect on jobs and on oil production. Charles and his brother David are personally responsible for founding and funding much of the modern conservative infrastructure. The popular libertarian think tank the Cato Institute was, in fact, first named the Charles Koch Foundation, Inc. before rebranding. The largest political organization in America outside the Democratic and Republican parties is Americans for Prosperity, the Tea Party–organizing foundation also founded by the Kochs. The latest organs in the Koch political network have carefully guarded the sources of their funding and direction. There is the new youth group Generation Opportunity, along with the new veterans-related campaign organization Concerned Veterans for America. But IER/AEA’s true origin casts new light on its motivations.